Leave it to the “Wondaland” artists to drop news of a new mini album unconventionally! 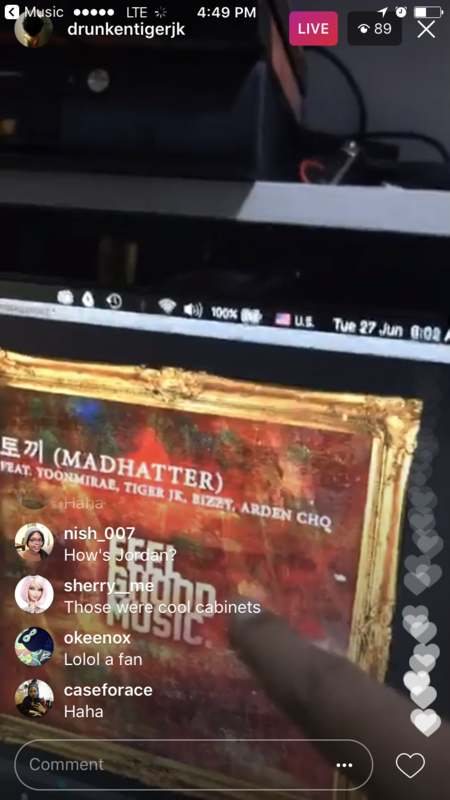 MFBTY members, Tiger JK and Bizzy, have become addicted to their Instagram lives as of late, dropping snippets of a Feel Ghood Music EP that’s coming out TOMORROW 6/27. The mini album will include all Feel Ghood Music artists, including Drunken Tiger JK, Yoonmirae, Bizzy, Junoflo, and Ann One. The album will also feature actress/singer, Arden Cho, of Teen Wolf fame. Arden became friends with MFBTY in 2013. The supposed song title is “Clap Clap Clap,” with a catchy hook graced by FGM’s leading lady, Yoonmirae. We’ve asked JK to repost his IG live previews, but he’s keeping the snippets ever elusive for those not watching his lives already! We recommend fans hit the follow button on IG and put boss on alert if they want to hear the album before anyone else! 6:06AM KST UPDATE: After TigerJK went live, more details have been released. The album will drop at 6PM KST. FGM has NOT finished recording it (LOL). Another song title, 토끼 (“MADHATTER),” was revealed. It is a collab between Arden Cho and MFBTY (Drunken Tiger JK, Yoonmirae, and Bizzy). Another song features MRSHLL (Marshall Bang), an artist that Feel Ghood Music was seen hanging out with at SXSW. If you’ve been living in the 90’s and don’t know what social media is, then you’ve completely missed the big news that Drunken Tiger, Yoonmirae, Bizzy (aka MFBTY) are coming to renowned awesome-encompassing South by Southwest. Yes, you read that correctly: MFBTY is performing in America. Over the weeks, we’ve been posited with a number of questions, including if the group will do extra shows nationwide, and if additional Feel Ghood Music artists are coming. With the performance less than 3 weeks away, we’ve broken down the most common questions to help all fans attending. The group will be performing FRIDAY, MARCH 17TH, at The Belmont, Austin, TX. They will be part of SXSW annual KPOP Night Out (hosted by KOCCA), a showcase of mainstream and independent Korean artists. Others performing include Red Velvet, No Brain, Big Phony, Hyorin, and Galaxy Express. On The SXSW website, you will see that MFBTY technically is not listed as an artist, but Yoonmirae an Drunken Tiger are. While listed as 2 separate artists, they will have Bizzy, and two other Feel Ghood Music artists, Junoflo and Ann One joining them. The set is to last 80 minutes (check SXSW GO for details). That is A LOT OF SONGS. Admission details regarding passes and wristbands are listed on the SXSW website. Passes don’t just buy you entry into this performance, but EVERYTHING at SXSW. Music wristbands will get you entry into all SXSW music shows. The event is 18+, contrary to past years being 21+. Will We (The International Website) Be There? Will There Be MFBTY Merchandise? That is something up to Feel Ghood Music. We have not heard anything about merchandise. Can I Bring My DSLR Camera? With the exception of press, attendees will generally not be allowed to bring professional cameras. All cameras will be inspected at the door. Phone cameras are allowed. Will MFBTY Be Doing Any Other Shows at SXSW Or On Tour? No, there is only one show. MFBTY hardly does US shows, so go to this or forever hold your peace. Please send your inquiry to Max Freedman max@maraudergroup.com. For anyone who emailed us, all your inquiries were forwarded already. Out-of-Towners, Book Your Plane/Hotels ASAP. The number of available and affordable places to stay is drying up (AirBNB is down to less 1% availability for close places under $120/night). The area you will be looking at is Downtown/University of Texas Austin. The further out, the more availability, but less transport options. Make a decision this week if you’re still contemplating flying in. Portable chargers, wall chargers, umbrella, lightweight clothing, extra shoes. It’s warm and rainy in Austin. Your phone will die, so bring everything you need to keep you connected. Downtown Austin is serviced by a number of rails, buses, and carriages. However, parking is a P-I-T-A. There is no Uber or Lyft either. Plan ahead for other car sharing options. SXSW is a massive music, film, interactive, EVERYTHING festival. Tons of free food, parties, drinks, etc. There are a number of social media accounts monitoring free events (most summarized here). Enjoy your time while in town! SXSW brings in thousands of people, most of whom leave Sunday. The Austin airport is tiny, and lines will be backed up (yes, even with TSA Pre-Check). Allow for 3-4 hours prior to your flight. If you have any other questions not answered here, email us or hit us up on any of our social media channels. 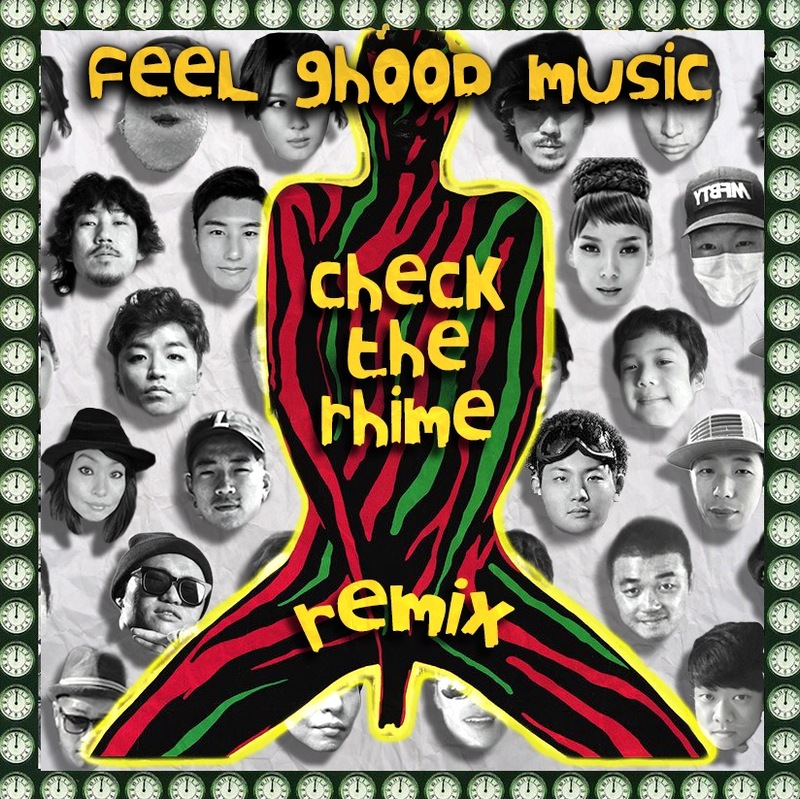 On the dawn of long awaited (and sadly, last) album of hip-hop pioneers, A Tribe Called Quest, all artists from Feel Ghood Music decided to remake ATCQ’s, “Check The Rhime” as a thank you for inspiring the entire FGM team. And with that, fan dreams became real, a reminder that our celeb biases do read their comments thread (Proceed with caution!). The track includes every member of Feel Ghood Music and its counterpart, Ghood Life Crew. If you’re not up to date, that includes Tiger JK, Yoonmirae, Bizzy, Junoflo, Ann One, Myundo, and Superbee. The exclusive (FREE) track will be available on hiphopkr.com later today. We got word a few months ago that power vocalist and regular Drunken Tiger feature artist, Ann One, would be releasing a track with our own Yoonmirae, and Rhapsodistas collective member, Rocky Rivera. With only a short audio preview released on Instagram, fans were left wondering what was the story behind this power collab. At 7PM PST yesterday, ISA Music Global (a division of ISAtv), gave us the answer. The song titled “Watch Yo Mouth” features AnnOne’s signature hypnotic vocals and the power verses of Yoonmirae and Rocky Rivera. Producers DJ Phatrick and Kiwi Illafonte add the intricate sounds that make this a center track for 18MillionRising‘s compilation album, which encourages Asian-Americans to get up and vote. The compilation features a number of heavy APA musical influences, and will be released at a later date. A bigger bonus? The track can be DOWNLOADED for FREE. Free dope music from 3 power artists? We’ll take it. Enter your email address to follow DT INTL blog and receive notifications of new posts by email.